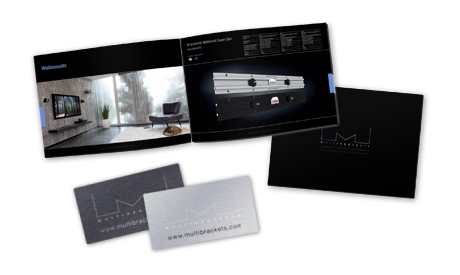 Welcome to Multibrackets Europe, one of the leading manufacturers of Audio Visual Equipment in Europe. Multibrackets Europe AB was established in 2001. At that time the company founders were selling flat screen TV’s and came up with an idea of how to make the wall mounts slimmer. The idea developed into a patented invention – the M Universal Wallmount. Over the years we have added a wide range of products to our assortment. Today we have one of the most comprehensive product lines in the world, and supply Audio Visual Equipment for every need. Our reputation for quality products and innovative ideas is well known. 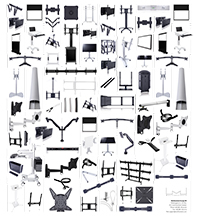 Multibrackets product lines, for consumers as well as for professionals, stand out for their quality and attention for detail. Multibrackets products incorporate the most durable materials such as steel and anodised aluminium alloys. Our projection screens are manually quality controlled before being shipped out, and the materials chosen for our projection screens meet the highest standards on the market. All Multibrackets products are subject to stringent testing. Produced in accordance with the highest norms, they offer guaranteed top quality and safety. 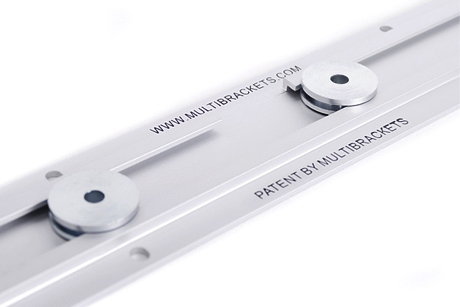 As an example Multibrackets Universal Wallmounts are equipped with a level metering bubble. Quality control is a part of the process. In addition, Multibrackets products comply with the standards within the EU, which include product exposure to three times the admissible load for consumer products and up to five times for professional products. Projection screens comply with the ROHS directive. The extremely sturdy mounting offers ultimate usability. Multibrackets products come with fittings, decorative caps, international manuals and a unique warranty. Our products are made to show their high quality, durability, feeling and appearance. To present the products the same way before they are unpacked we put effort in the design of the gift boxes, and how we pack our products in them. The gift boxes are made with the highest quality materials, smart thinking and even smarter packing: This creates a perfect way for you to present the Multibrackets product line in your store. The gift boxes stand out and helps the end-user to choose the right mount for his or her needs with little or no extra help. We make your stock rotate quicker! Most manufacturers want you to carry their stock, in exchange they will give you better pricing. We won’t. We carry our own stock of all our best selling products, cutting delivery times by weeks! There is no need for you to purchase large quantities and overload your stock when working with us. Stock rotation is a key to reach the right price and the right products in stock, at all time. Multibrackets Europe is one of Europes premier source of peripherals for Audio Visual products, with well over 600 different items in its portfolio. We are offering a broad range of high-quality, full-featured products in a variety of form factors, at competetive pricing. Our product selection provides a versatility exclusive source of one of the finest and most comprehensive line of Audio Visual peripheral products available on the market today. Our success is based on helping our partners succeed. To achieve our ambition, we focus on adding value to your contribution, and to deliver a truthful personal service. In addition, our product line is comprehensive, which results in us only supplying the best products in each segment. As our specialisation is peripherals for Audio and Visual display products, we are thoroughly knowledgeable about all the products we offer. Therefore, we are able help you with anything from technical support to customisation. Multibrackets partners can always count on prompt responses, direct communication and good value. Furthermore, we use our background in the industry to deliver superior technical support and technical solutions to match the need of yor customers for our products. Additionally, we offer an excellent after service to our product lines, making a helping hand never be far away. Our goal is to build a strong network of distributors and dealers throughout Europe. We will continue to offer our partners only the best products available. We encourage you to become a partner and enjoy the benefits of working with Multibrackets Europe. Multibrackets is continuosly improving the way products are made and how they are transported. Green means business! Multibrackets is continuosly improving the way products are presented on the web. Latest information and photos are updated on a nearly daily basis. We are connected to the CNET Channel and Webmercs for correct and quick distribution of information and technical specifications for all of our products. With a corporate project called "Ethics and Compliance" Multibrackets wanted to confirm its efforts as a company of ethics and social responsibility. The identity of our group is historically based upon values that through the years have been pursued and absorbed by all of us, the same values that have made possible the enrichment and consolidate our company culture. These rules from which our company values grow is clearly normative in order to prevent wrong doings, they have been formalized in the company organizational structure, in which the ethics code is the core. The ethical code is diffused in a way that makes it available to all Multibrackets employees and partners. Each individual cooperating with Multibrackets or employed by is reminded of the personal responsibility to which he has been entrusted with, in order to ensure a normative process. Our code of conduct for fair production & working conditions in an environment that is friendly to our planet can be found here. Interested in Multibrackets Europe AB newsletters? We will make sure that you are updated with Multibrackets Europe AB latest news and major changes. Please, feel free to subscribe your e-mail in the form below. 'STOP NEWSLETTER: your.email@yourdomain.com' in the form below. Multibrackets Europe AB ensures that your e-mail will not be used by or sold to any third party. Multibrackets’ ingeniously simple, discrete and elegant design is, as you can see for yourself on this website, truly unique. One of the markets widest range of products. All our products are truly unique and discreetly elegant in design. All products are packaged in stylish packing to be self promoting in shops or other areas for display. All products are made to be very easy to assamble. Our patent pending Wallmount add only approximately 4,9 mm from the wall. (With most other wall mounts on the market, that number is 20-30 mm). In addition the exceptional features and packaging the Multibrackets product range is also one of the best priced on the market, giving distributors and retailers a good margin.